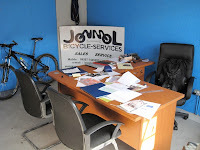 For those of you that weren't tuned in last year, we established Jonmol Bicycle Services with Jon "Bones" Moletsane in Gaborone, Botswana, with a lot of hard work, a lot of investment, and 404 bicycles generously donated from our customers. Though Ken and Matt were in Gabs to help Bones create the shop last year, this was the first time they had been back since, and of course it was the very first time I had ever seen the shop. What struck me initially about Jonmol was nothing. Literally nothing at all. 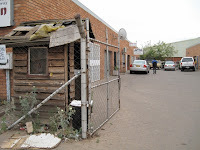 Bones' shop was located inside a private alley of sorts off of a busy one-way street in a bustling commercial district. And though there were signs everywhere for every kind of business imaginable, Jonmol had no sign that was at all visible from the street. Once we pulled into the alley, I finally saw the sign that I'd seen in so many pictures before. But if I were a passerby. . . well, I'd have just passed on by. When we arrived at the door of the shop, I was impressed by the large glass windows that let sun into Bones' front room, they were huge, just like the windows in the fronts of our shops. The problem was that they were also completely empty. There were no shiny bikes to entice folks that were walking by, or even to let them know what Jonmol was selling at all. Bones welcomed us warmly and introduced us to his crew. 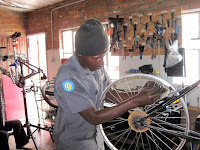 He had three employees who all met us with big warm smiles: Jerry, who was essentially his right hand man, and two mechanics, Tambudzaxi, and Tshepo. While touring Bones' shop, I was pleasantly surprised with the layout and size of the place. The front room was a nice, light, and airy spot with a tall counter and a wall of parts and accessories behind it. While the floor space in front of the front windows was troublingly empty, there were a handful of partially-built kids' bikes against the brick wall. I really got a kick out of the printed photos that were up in the front room—the staff and some local bicycling events were represented, and there were even a few from when we brought Bones to California last December. The back room and workshop presented some more challenges, and luckily, some bright spots too. It was quite big, but dark, with just some small windows on one wall and relatively poor fluorescent lighting. There were quite a few bikes around, both hanging from the ceiling, and neatly stacked in rows against each other, with a loose system of organization. 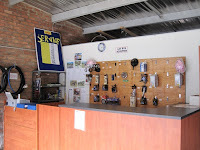 It included the standard bike shop breakdown: Bikes that were awaiting work, awaiting parts, completed repair bikes, and new ones for sale (most only partially built, however). The workshop area had a nice counter with display shelves underneath (sporting messy piles of parts and accessories inside them). It had two workstands that were being used a bit differently in orientation than we tend to use in the U.S., and there were lots of seemingly random parts all over the workbench, shelves, and on cardboard sheets on the ground. One of the highlights for me was their wheel truing stand, which was simply the chopped rear triangle of a bike frame that could be placed in a workstand. The wheel to be straightened was bolted into the frame and the brakes were used to as a reference point for adjusting the spoke tension to true the wheel. A loosely organized tool wall, which seemed to have all of the basics covered, completed the work space. The last bit of our tour of Bones' shop was the electric-blue-painted office off the front room. Like many other things here, it was both very basic and surprisingly modern, with a simple desk and a few chairs. Not much else was there other than some papers and ledgers and the small netbook-style computer we provided him with last year. 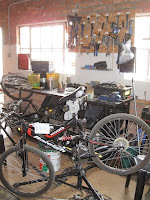 And Bones' personal bike was in the office, a nice black GT Avalanche with Shimano Deore components. It looked clean and well maintained, the type of bike that you could tell the man takes pride in. We could relate.